Spring Break is quickly coming to an end, and I am quickly beginning to realize that I need to get myself into gear and prepare for the next three weeks. You see....we are in crunch time to The TEST! Ahhhhhh!!! I know that I have tried my hardest to get them ready, the standards have been my bible, but 5th grade is really a hard test year (all of those odd years are) and it is just so unpredictable. But I digress. 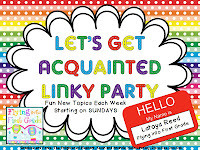 Since it is still Spring Break, I thought I would relax just a bit and link up with Latoya at Flying into First Grade and play "Let's Get Acquainted". Admittedly, I am late to the party here. Latoya has been having this linky for quite some time now, and I have learned a great deal about my fellow bloggers....but I have never joined in....until now. So without further ado, My Favorite Things. I seriously can not get enough of Target. If I could live there, I probably would. It is one of those stores that I can't walk out of without spending at least $150. Crazy. But oh so good! Oh television, how do I love thee? Let me count the ways.....There really are so many shows that I can't live without. Each day I have at least one in fact. But right now, if I had to pick one, it would be The Walking Dead. I just get so engrossed in it, like the world actually surrounds me. It is just so so so so good. Appointment TV for sure. My life has been moving forward in such great directions lately. I have already told you about our move (which was desperately needed...our family of 4 simply could not live in our 900 sq ft house any longer) I am so stoked about it and am loving the new (twice the size) house already. 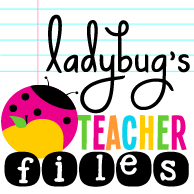 But the second new development is reason that I have been slacking lately at this thing called blogging and the Quarter 4s of the math homework for both 4th and 5th grade are just not finished. I just have not been feeling like myself lately...tired and icky most of the time. I couldn't bring myself to sit in front of a computer for very long as it made me feel nauseous. However, I am now starting to put that all behind me and get myself back...so I think it is time to tell you all why I have been so scarce (and slacking) lately. Meet the newest development in Room 6. We will officially meet this little one this fall. But until then, develop away little one! Congrats Stephanie on your new development :) I'm so excited for you and your family! Congrats on your newest development! How exciting! Congratulations on the new house and the new member of your family. On a totally different note, I can't believe tonight is the season finale! I hate the wait in between seasons. Yes, congrats on the new baby and the new house (is new carpet smell as good as new car smell?)! I L-O-V-E Walking Dead. I miss Shane every episode. Congratulations! Now you will have a new reason to shop at Target. Congrats!! That is so exciting! Completely understand why you haven't been around. Congratulations!! How exciting! I can totally relate to your love for Target. My husband will actually tell me I'm "not allowed" to visit the dollar bins some months due to funds ;) baha! There are just so many fun treasures in Target! Enjoy your last moments of break! Aw Steph I adore YOU!! Thank you for saying that, I'm so glad we have been able to blog together all this time. Yayyyyyy!!!!! A new baby is so exciting :)))))) Love, love, love the good news! Congrats on your new baby! That is so exciting and will be your most favorite thing! Awww! This is the best "Let's Get Acquainted" linky I've read today! Congrats! That is so fun! Congratulations, Stephanie! Your new development is so exciting! Oh my goodness!! What a sweet surprise! Congratulations! Oh, I am the same way with Target! And I always find things I need for my classes in the dollar section, which is GREAT! 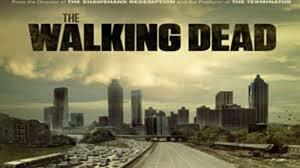 Could you believe the Walking Dead last night??? Oh my goodness!!! And just because it's worth saying twice ... or a million times ... CONGRATULATIONS!!! I am SO excited for you!!! Congratulation! I love your blog and all of your work! More happy days ahead! Many congratulations on your baby news!! I am so inspired by all that you share on your blog. Thank you so much! Blessings!! Congratulations! I just repeated your catchy phrase, "What Good Reader's Do' today! I guess it was mental-telepathy or something that made me curious to check on you!!! Woot-Woot! OOPS! "What Good Readers Do!" Congrats!! I know exactly how you feel. My little bundle of joy is due in September. I really need to catch up in the Walking Dead. I still haven't watched last season. Congratulations on the new house and the expanding family! Your blog favorites are some of my favorites, too. Congratulations on your new little one! 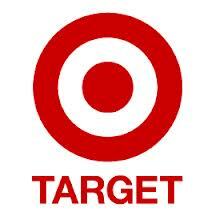 I also LOVE Target and the bloggers you listed :) Neat fact - The Walking Dead is filmed VERY close to where we live. My hubby has gone to watch it when they are filming and we know several of the extras :) It's really neat to see one of our favorite towns transform into a t.v. set. Congratulations!!! I'm so happy for you!! Congrats! Such a wonderful blessing!